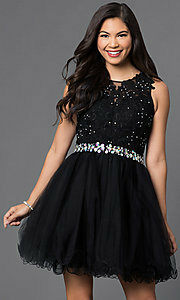 Here's a short babydoll homecoming dress that allows you to dazzle in the spotlight without breaking the bank. Under $100, this adorable scoop-neck party dress has shimmering beading scattered across the illusion-lace fitted bodice. Wide lace straps drape over the shoulders to beautifully frame the back cut-out detail. Light-reflecting iridescent jewels top the whimsical tulle skirt that flares away from the hips in layers before ending in a trendy rolled hemline. Available in misses and plus sizes, this short babydoll homecoming dress is a radiant yet youthful style for your semi-formal event.